The Fourth Quarter is Here! September 30, better known as The Day Before the 4th Quarter has arrived. Beginning tomorrow we’re off to the races. October 1 thru December 31 is often the busiest part of the year for fundraising professionals, especially those in the annual fund world. And there is no better time to take a moment to regroup. For many, the fourth quarter of the calendar year is ‘make it or break it’ as year-end mailings, phonathons, emails and more are increased to frenzied levels. While I’d recommend a more balanced strategy throughout the year, it’s hard to deny the culture of giving that exists during this period. As nonprofits begin the giving season, it’s the perfect moment to step back and examine your readiness for the next 90 day period. Missing a deadline or two can make the difference between success and failure. Even a few days can have a significant effect. I can’t tell you how many horror stories I’ve heard of nonprofits with mailings set October 15 or November 1 that miss deadlines by a couple of weeks. This, in turn, effectively reduces the solicition cycle prior to 12/31 by the same amount of time. Take a few minutes today to meet with your staff. Review your solicitation calendar, your timelines and progress. Are you ready? If you’re producing mailings in-house, do you have the materials? Have they been ordered? Has your team dedicated the time necessary to produce and mail everything on time? Do they understand the importance of the deadlines you face? If you use outside printers or mailshops, are they ready? It’s their busy season too. Have they set aside time for your projects and understand the importance of delivering them at the proper time? There may be instances where a deadline can be missed by a day or two without a negative effect. This is not one of them. Deadline means deadline, and everyone involved must understand this. A few minutes today may save days or weeks later. Having everything ready to go will make your holiday plans more enjoyable if you aren’t worrying about your mid-year numbers. Good luck! May your 4th quarter be your best yet. Too often, we spend all of our time letting others know what our institution wants from them. It’s a ‘gimme gimme gimme’ attitude and it doesn’t optimize the relationship with our donors, especially leadership annual fund, major gift and planned giving donors. Maybe it’s time we listened a bit more. The most successful philanthropic relationships occur when the donor and the organization are in sync. When the donor’s aspirations can be fulfilled by making a gift to your organization, the resulting gift is good for everyone. Both parties in any transaction have interests. The institution wants funding for something of value to them. Let’s not forget, the donor has interests too – and they’re holding the checkbook. The donor is trying to utilize their financial resources to make a difference in some way that is meaningful to them. The best situation for everyone is when the interests of both parties overlaps. A lot. The closer the organization comes to meeting the donors’ desires, the more likely they are to receive a gift. As the overlap increases, so does the size of the gift. And, if all goes well, it might be the first of many. Rather than spending so much time ‘selling’ our ideas to donors, it makes sense to stay quiet and listen a bit more than we talk. 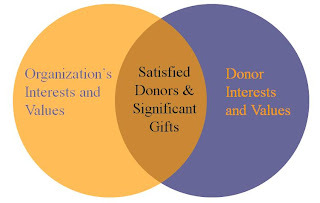 Once you learn more about what the donor is trying to achieve, you might be able to match their interests with yours. And that’s when the magic happens. Many thanks to Kay – one of the gettinggiving.com faithful – for forwarding an article earlier this week about for-profit online education. Both “scary” and “progressive” are words to describe Kevin Carey’s vision of higher education in the future. . . a comprehensive catalog of classes that can be delivered with a simple click of a mouse. Carey, by the way, is a policy director for Education Sector, an independent think tank in Washington, DC. While we all know this technology is available today, I think “We Ain’t Seen Nothing Yet” pretty accurately sums up this topic. Carey’s article highlights the emerging world of online educational opportunities that may, in the future, offer a complete and affordable alternative to the traditional college campus experience. One example includes a service that allows students to take as many classes they want, work at their own pace and complete each one as quickly as they are capable of doing so — all for the low low subscription fee of just $99 per month. That’s right, $99. I guess if you gave up sleep for a few months and put your nose to the grindstone, that diploma could be hanging on your wall by the end of they year. And it might cost less than the frame. I’m not sure how I feel about this. As I’ve said before, I’m a techno-geek and all things like this intrigue me. In fact, I might just sign up to try it out. However, much of the learning process associated with college takes place outside the walls of a classroom. I don’t think I want my kids to stare at their computer monitor every day and end up with a degree a year or two later. I want them to meet new people and become more independent. I want them to have eight roommates in a two-bedroom apartment. I want them to wear school colors and root for the home team. I want them to walk across campus when there’s three feet of snow just like daddy did. Above all else, I’ll want them out of my house rather than sitting at my kitchen table taking online classes! I certainly know I couldn’t put a price tag on the experiences I had in college and the growth I experienced in those four short years. (NOTE: Yes, it only took 4. I screwed up because I really should have taken at least 5 if not 6 years to enjoy the journey). I’ve thought about getting my MBA online, but as the article points out most reputable programs actually charge MORE to get a degree online than they do if you’re on campus. I understand the ‘convenience fee’ and all, but it really is ridiculous when you think about it. It’s kind of like letting me visit the bank for free (using valuable space, teller wages, etc.) but the ATM charges me $3 just to withdraw a twenty-dollar bill. I know loan sharks with better deals than that. At $99 a month, this is no longer an issue. Regardless, the article is fascinating. For those of us working in the traditional college campus environment, we need to spend more time thinking about how to work with those graduates who may never (or at least infrequently) step foot on campus. I know most online programs are still relatively small, but they grow dramatically each year. I’m not sure what the fundraising outlook is for those audiences, but if we expect to engage them in the future we’d better start thinking more about this issue today. Right now they’re usually just a minor outlier in our strategy and it doesn’t make much of a difference to our programs. This will no longer be the case as our online alumni population expands significantly. It’s possible we’ll find that we simply don’t have much potential in this arena. Or not. One way or another, we’ll find out soon. Read Kevin Carey’s article here and if you have any words of wisdom from your experiences with this type of population in your program be sure to share! There is a touching article on Bloomberg.com today that demonstrates the power of philanthropy. It’s a short piece about David Robinson (NBA Superstar) and his relationship with a group of kids at Gates Elementary in San Antonio. His personal pledge to these students was to pay for their college education if they met some basic requirements such as attending some mentoring meetings, not having attendance problems and staying in school. These students, now successful adults, are interviewed about the experience and the impact Robinson had on them. Their success is Robinson’s reward. When they ‘pay it forward’ by helping others will help Robinson’s support grow exponentially over time. This article provoked some though about my own charitable contributions. By a quick calculation, I give somewhere in the range of 3% to 3.5% of my annual salary in a variety of ways. My university gets the biggest chunk, and the rest is spread among several other smaller nonprofits, most local. However, I’m not sure I’m getting the outcome I could were I to be more thoughtful about my philanthropy before making a bunch of gifts. To make a difference, philanthropy requires careful thought and planning. Just what is it I want to accomplish? How will I know I’m making a difference and not simply taking a tax deduction? Is this the best nonprofit to facilitate my priorities? The biggest question for most, and the answer “YES” is the right one, is this: Can somebody who doesn’t have NBA-Superstar money really make a difference in the world? I’ve decided to spend significant time setting my goals for 2011 between now and the end of the year. The first goal is simple: Increase giving to 4-5% of annual income. This is a reasonable increase and a number I can feel comfortable with at this stage in my life. That’s the easy part. The hard part is determining how to allocate those philanthropic dollars. We often think of major gift donors having made an ‘investment’ in an organization. Their thoughtfulness is applauded, their objectives clear. Isn’t this true for many of our annual fund donors? They’re investors too. What may seem like a ‘penny stock’ to some is a considerable investment to others. Making wise investment choices determines a individual’s philanthropic success much as an investor determines the success of his or her portfolio. Over the next several months I’ll be thinking quite a bit about where I want to focus my efforts for the next few years. My ‘philanthropic roadmap’ will outline the basic needs I wish to address, the financial resources I want to dedicate and, additionally, how I can personally be involved in the efforts I support. To be honest, I’ve been a pretty hands-off donor in the past as time is often more difficult to come by than anything else. I’m not sure if I can achieve my goals and still take such a passive role in the process. That’ll be a big part of the planning process. The funny thing is, we forget that donors everywhere have differing feelings about what a ‘significant gift’ is to them. Whether they give $500 or $500,000, they are thinking about the same things I’m describing here. When we ask them to contribute, we’re asking to be a part of that planning process and to invest in our mission. We must meet their needs by providing careful stewardship of their contribution and by reminding them often how their investment is reaping dividends for our organization. In turn, that makes them happier about their investment. Their ‘philanthropic roadmap’ has plenty of detours – we need to make sure we’re on the same road they’re traveling if we want them along for the ride. Take a look at Robinson’s story and you might just be inspired to take some time to think about what your roadmap looks like too.